GREEN THUMBS RUN IN OUR FAMILY TREE. Gurton's is a friendly neighborhood houseplant shop founded and curated by Julina Abbott. For as far back as we can tell, our family has been blessed with uncannily green thumbs—from great-great-great (great!) grandpa Henry Gurton the royal florist, to his son Ted the dapper backyard rose gardener. Then there's great-great grandpa Jack (pictured above), a nursery owner and propagator of rare flower specimens, and don't forget Marj—Julina's grandma, whose yard is overgrown with monster succulents we'd give our left arm for. 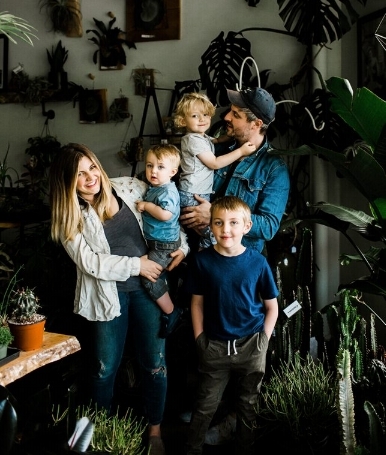 Today, with three little dudes who love to lend a hand in the garden and at the shop, we’re happy to say Gurton’s Plant Shop is backed by 7 generations of green thumbs—and we’re here to help you nurture yours.